Was Grampy at a crossroads, Curtis? Greg, I’d be less concerned with the “con man” label, which after all sounds sort of quaint and roguish, and more with the implications of the pitchfork. Since there isn’t a lot of conceptual overlap between con men and farmers, I have to assume that Diane is suggesting that Greg’s father/grandfather/whoever is an actual demon, from hell. Is she worried about his presence in her innocent son’s dreams? Is he attempting to cross over into he real world, Freddy Krueger-style? Speaking of demons from hell, we’ve finally discovered something that even Marmaduke is afraid of: the Wham-O Corporation’s trademark lawyers. 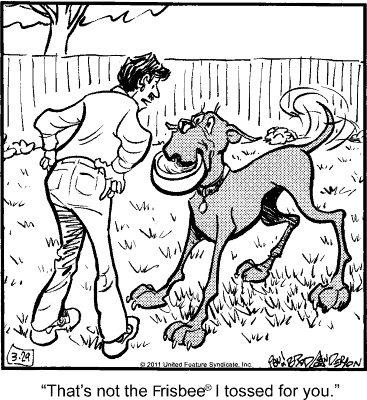 I don’t know what’s sadder: the thought there are teams of lawyers paid to read the comics to make sure they don’t tread upon anybody’s trademarks, or that the Marmaduke artist might scrupulously add the appropriate symbol to registered trademarks unprompted. Two weeks ago, General Halftrack slipped off to the woods to quietly kill himself. Today, in a very special Beetle Bailey, Beetle finds the body.